As with any piece of art you want it to compliment or coordinate with the colors of your room, furniture, other art, etc. Even though I use a good quality camera for my photos, it may be difficult to tell if a particular color is going to work in your decor. I recommend that any customer with concerns about color should request a swatch of fabric(s) which I will mail to you for color checking. Often when I make custom quilts there are a few weeks before the actual creation begins when I ship fabric samples to customers for their approval, especially if their room has an unusual shade of a color with which we want to be sure to compliment and not clash. 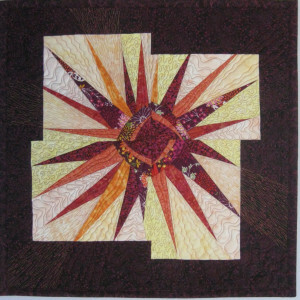 If you have ever seen a quilter’s studio, you would understand why I can say with confidence that it is very likely I can find a swatch or swatches of the fabrics in just about all my quilts, even a few years after the quilt’s creation!! We never throw anything away! Another solution is for a customer to send me paint swatches or fabric swatches of upholstery. Recently I made some quilts for a remodeled bathroom for a customer and they gave me paint and tile samples to reference while their quilts are being designed. This was very helpful. Equally important to seeing fabric samples is understanding that colors don’t need to match. They can be different shades or combinations of colors which compliment a dominant color in your room. 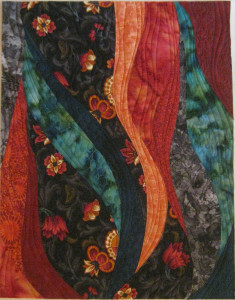 Many of my quilts combine a variety of colors in different shades, tones, sometimes complimenting and sometimes contrasting. 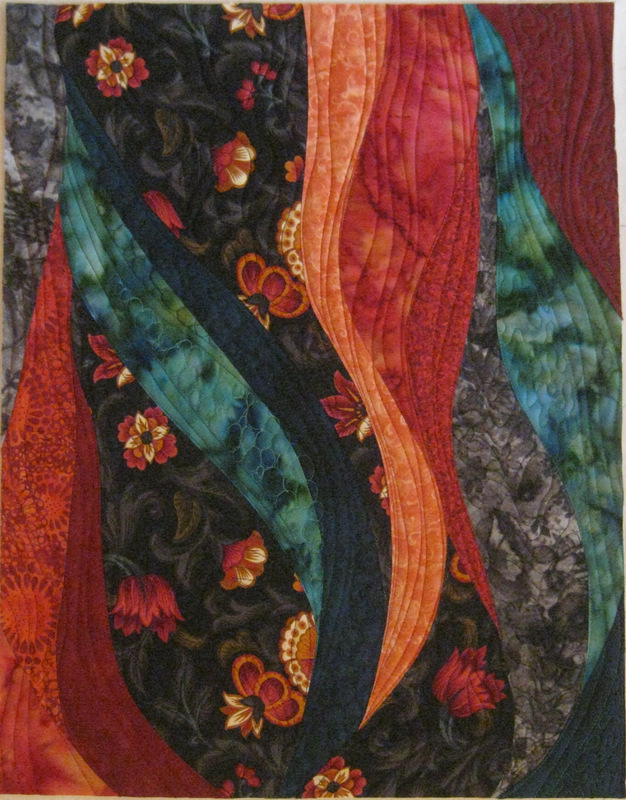 If you look at some of my more colorful quilts you can see how beautiful and fun it is to combine colors you might initially think would be crazy together. Playing with colors, introducing new colors or a splash of color into a neutral room, can change the FEEL of the room. Color has a dynamic impact on us even if we aren’t aware of it. Be brave and explore new colors in your life! Consider adding an art quilt to jazz up a room and you will learn that your mood will also be affected….in a good way!